Business leaders have warned that Sunday parking charges set to be rolled out risk “driving customers away” from the city centre. The city council will launch on-street pay and display charges on Sundays in the 2019/20 financial year, as well as existing charges going up between three and 20 per cent after the budget was agreed last week. The authority hopes to roll out the new Sunday charges from April – but has warned that legal processes could lead to delays of “up to 18 months”. 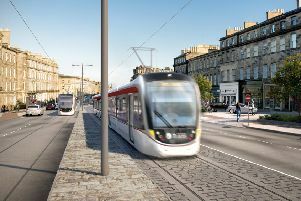 The zones 1-4 as well as 1A are set for the new Sunday charges including the city centre, the West End, Tollcross, Southside and Fountainbridge – along with “main traffic routes”. The Federation of Small Businesses (FSB) has raised concerns that the changes will hamper traders in the city centre. Garry Clark, FBS east of Scotland development manager, said: “Many city centre businesses will be angered by the introduction of Sunday parking charges and increases to parking charges, which are already amongst the highest in the country. “Small businesses often rely on passing trade, so the availability of free parking on a Sunday has helped to connect them with customers. Losing free parking could risk driving customers away towards the big retail parks. The council is pressing ahead with the price hike despite officers admitting that during this financial year, expected parking revenue is set for a £372,00 shortfall. Queen Street, Market Street and Cockburn Street are set to rise to £4.60 an hour – while motorists parking in the Stafford Street and Melville Street areas, Morrison Street to Shandwick Place and the Old Town will be charged £4.10 an hour. All other on-street pay and display zones and residential permits are going up in price. Conservative councillors have also blasted the council’s decision to bring in Sunday charges and increase current rates. Tory transport spokesperson, Cllr Nick Cook, said: “Edinburgh’s SNP/Labour administration has again used its budget to impose excessive cost hikes on pay and display parking. “The projected shortfall in revenue lays bare a council more concerned with demonising motorists and placating the cycle lobby than encouraging people to visit our local businesses. Green councillors have backed a review of parking across the city to investigate the £372,00 shortfall. Green transport spokesperson, Cllr Chas Booth said: “Parking charges are an essential way to ensure our city centre does not get completely clogged with vehicles, and to encourage those who can, to use public transport, walk or cycle for their journey instead. The council said it is investigating why the parking revenue shortfall has occurred. Transport and environment convener, Cllr Lesley Macinnes, said: “As Scotland’s capital, parking here is, unsurprisingly, in demand so restrictions are necessary for keeping the city moving, while also ensuring residents have enough space to park their own cars.